WHAT IS A SMART HOME PROFESSIONAL? Home automation specialist, technology integrator, home technology professional, custom electronics dealers—these are just a few other names for what we like to call a smart home professional. From security systems and smart home automation to custom home theaters and intelligent lighting, smart home professionals are trained and experienced when it comes to designing electronic ecosystems that turn houses into dream homes. Smart home professionals are armed with tools, resources, and experience to create truly intelligent homes. They work with manufacturers to receive special training on how to best deploy devices and design orchestrated systems that seamlessly connect individual gadgets and appliances into one, easy-to-use smart home system. Smart home professionals have been certified as programmers, installers, and computer networking specialists and have years of experience when it comes to customizing electronic systems. In the U.S., many smart home professionals are members of business associations like the Custom Electronic Design Installation Association (CEDIA), the world’s largest association of smart home professionals, that helps with resources like educational programs and networking opportunities and connects them directly with manufacturers. 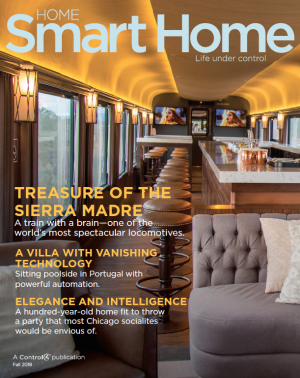 Smart home professionals, especially ones who work with Control4, have access to incredible resources that make them a valuable asset to homeowners, home builders, and interior designers. As trained experts, they offer consultations to develop smart solutions that are customized to their clients’ needs and desires. They can incorporate security systems, home cinemas, multi-room audio and video, smart lighting, as well as other smart home products and electronics in your home and make them work together so simple commands or single clicks can control multiple devices at a time to make your home more convenient and secure. They begin by providing a consultation. First the homeowners, home builders, and/or interior designers outline their initial interests. Then the smart home professional assesses the existing infrastructure or plans to determine what’s possible and oftentimes suggests even better, or simpler, solutions for what the client is hoping to achieve. They then review solutions with the client and create a design that will work for the space and create a lasting solution that will wow the homeowners. Consulting a smart home professional early is the key to creating truly seamless solutions that blend beautifully into the home. A good smart home professional can bring immeasurable value to a project when involved in the early planning stages, and work best when they can consult and work with any other contractors that have been hired for the same project. If you bring a smart home professional in early, they can discuss where things need to go and do what needs to be done for an installation to come together beautifully and effectively. Pre-wire a house to hide wiring without having to tear into walls. Determine in advance where outlets need to go for effective coverage and interior decor can better hide them. Work with the general contractors to leave room for any speakers or electronics that you want to have built-in or hidden inside the walls. Advise homebuilders about using building materials that will not disrupt wireless signals. Working side by side with qualified specialists can deliver far better experiences for all involved because most clients don’t know what to ask for and because designers are rarely technology experts. A consultation with an experienced smart home professional can provide opportunities to creatively solve other problems by using technology. Use motion detection, cameras, and intercoms to allow aging loved ones to maintain independence while making sure they are safe in their homes. Monitor your front porch and remotely control door locks and alarms with Intercom Anywhere. Leak detection and automated water systems can help prevent flooding and also help make homes environmentally friendly. Why choose a Control4 smart home professional? Smart home professionals who work with Control4 are held to high standards and have strict requirements regarding certifications and experience that they must achieve in order to become an authorized Control4 dealer. Control4 professionals are also given opportunities to get hands-on training in live testing environments with expertly crafted curriculum. When designed and installed properly by a trained, knowledgeable technician, home automation systems are able to perform amazing feats. From the network foundation to the personalized touches that make your house a dream home, the smart home professionals that work with Control4 are experts in designing and installing whole-home automation systems that are matched perfectly to the lifestyle of any individual or family. When you choose a Control4 smart home professional, you know your home is in good hands. Interested in working as a smart home professional? Follow #SmartJobs and Control4 on social media to see job postings and connect with our dealers. Want to learn more about Control4 smart homes?